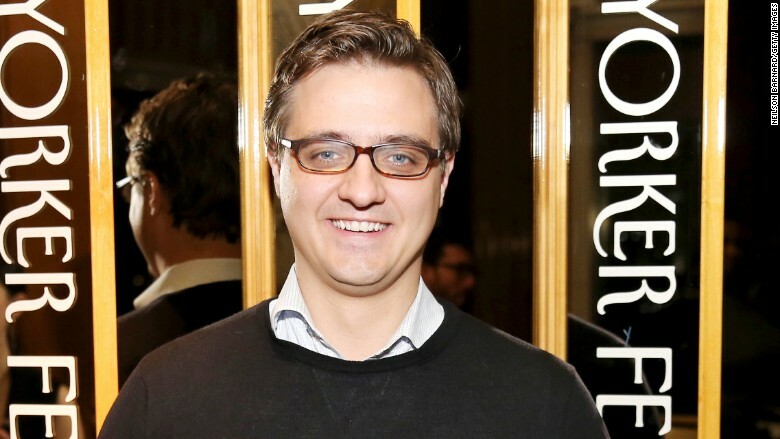 Chris Hayes, the host of MSNBC's "All In with Chris Hayes"
Chris Hayes has spent the last year of his life hearing that his show is about to be canceled. When MSNBC's ratings took a nose-dive in 2014, "All In with Chris Hayes" was said to be the first show to the chopping block. When Andy Lack took over the NBC News division in March, he was reportedly intent on freeing up Hayes' 8 pm hour. And when MSNBC finally began shedding shows over the summer as part of an effort to rebrand as a straightforward news channel, Hayes was seen as a certain casualty. The reports weren't wrong. Lack has been trying to replace Hayes since he arrived in March, and MSNBC President Phil Griffin had been considering a change since well before then, MSNBC sources told CNN. Hayes show, which launched in 2013, was ratings averse from the get-go, and has set record lows for the 8 pm hour -- one of the most coveted and competitive hours in cable news. In the most recent quarter, it averaged just 134,000 viewers in the demo, a distant third behind Fox News and CNN. Lack hasn't stopped looking for a replacement. The problem is that, in television, good hosts are a rare commodity. In the Venn diagram of cable news talent, the overlap between personalities who can successfully host a show and those who want to is thin. Earlier this year, Lack considered bringing Bob Costas, the veteran NBC Sports personality, over to launch a new weeknight show in Hayes' timeslot, several well-placed MSNBC sources said. The idea never panned out. More recently, Lack has considered bringing back Keith Olbermann, the man largely responsible for MSNBC's transformation into a liberal commentary machine. But sources said Lack isn't sure he wants to deal with Olbermann's drama -- the host last left MSNBC (and almost every other network he's been at) contentiously and amid controversy. In addition, it would go against Lack's efforts to shed MSNBC's reputation as a liberal network. So for several months, Hayes has been left in an awkward limbo, knowing that he's supposed to go without being asked to leave. "Chris knows he's going to go -- he's known that for a year. It's just he just doesn't know when," one MSNBC source said. "They can't figure out who is supposed to replace him." The effort to replace Hayes has been complicated by three factors: First, Lack has been too busy trying to relaunch MSNBC -- and the career of Brian Williams, the former NBC Nightly News anchor -- to focus on finding new talent. Second, Lack recently moved Al Sharpton to weekends, and needs to find a replacement host for his 6 pm timeslot. Then there's the third reason: Last Monday night, "All In with Chris Hayes" won an Emmy for Outstanding News Discussion and Analysis. It was the only Emmy MSNBC won that night. And while that wasn't enough to save Hayes from getting axed, it was enough to delay the execution. Since the awards ceremony, MSNBC has been promoting the win, and NBC News included Hayes' honor in its own promos. "It's sort of hard to ax the guy you're promoting," an MSNBC source said. Those close to Hayes says he has no illusions about the future. More specifically, they say he has no idea about the future. His show could be canceled in a matter of weeks, or at the end of the year, or after the 2016 campaign. Or never. "It's not really about Chris, it's about whether or not Andy can find a replacement," one of the MSNBC sources said. As one MSNBC source put it: "It's possible that by the time Andy comes up with a solution, the solution is to let Chris stay."